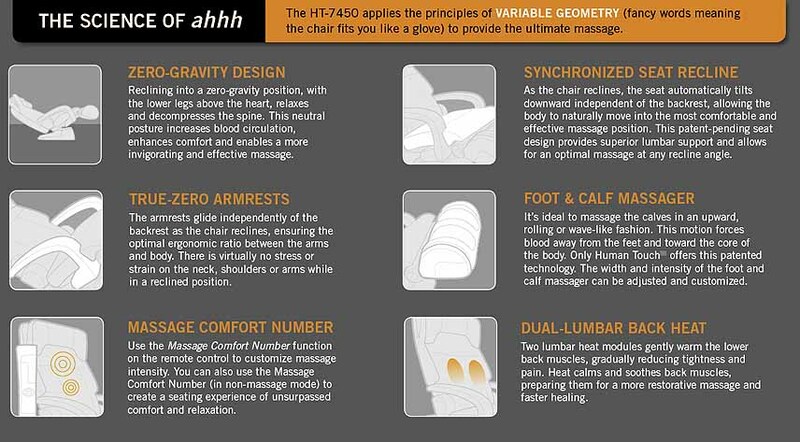 HT-7450 ZERO GRAVITY Human Touch Home Massage Chair / Recliner + Heat - Introducing the Human Touch™ 7450, the world's first massage chair that incorporates the latest advances in both massage and back-care technology to virtually defy gravity's adverse effects. 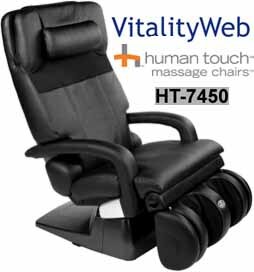 As the HT-7450 reclines, its back, seat and footrest synchronously move to position the body in a virtually weightless condition – the ideal posture for massage. 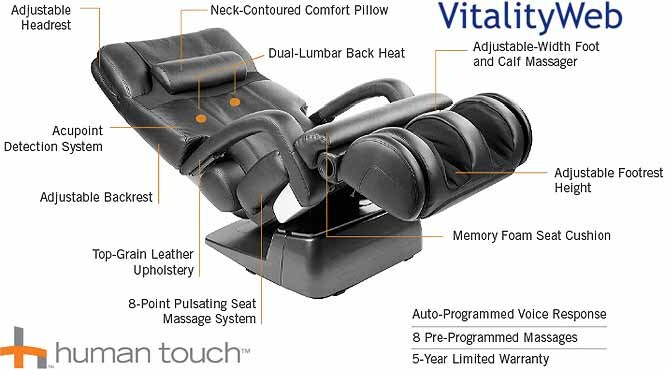 From there, the patented human touch massage system™ goes to work, providing a deep, invigorating massage of the neck, back and legs, leaving you feeling refreshed and recharged. The HT-7450 is the first chair of its kind. And with its revolutionary design and numerous engineering advancements, back pain – and gravity – will no longer keep you down. Available in Black, Espresso and Dark Chocolate. NEW chairs include continental USA Ground Curbside Shipping and Sales Tax. Adjustable Headrest: Easily adjust the headrest to read, sleep, or just relax in pure zero-gravity comfort. Acupoint Detection System: To ensure an effective and targeted massage for all body sizes, types and pressure points, Acupoint scans the entire length of the back to create a map of key pressure points to target during the massage. 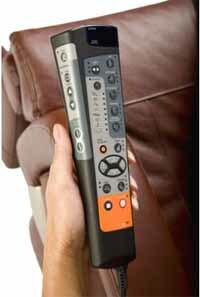 Adjustable Backrest: With the push of button, you can adjust the angle of the backrest. Top-Grain Leather Upholstery: Premium-grade leather is secured directly to the frame for maximum durability and aesthetics. There are no loose pads or sliding pillows to get in the way of premium massage comfort and performance. 8-Point Pulsating Seat Massage System: The precisely designed pulsating seat massage targets the key pressure points of the sciatic nerve along the buttocks and upper hamstrings to promote optimal lower back relief. Memory Foam Seat Cushion: Enjoy the unsurpassed softness and comfort of the same memory foam that cushions NASA astronauts as they lift off into space and that is found in today's most expensive beds. Adjustable-Width Foot and Calf Massager: Both the width and intensity of the foot and calf massager can be adjusted and customized. Dual-Lumbar Back Heat: Two lumbar heat modules gently warm the lower back muscles, gradually reducing tightness and pain. Neck-Contoured Comfort Pillow: The leather upholstered pillow with comfort foam precisely conforms to the contour of the neck for optimal support and superior comfort. Extended 2 or 5 year Human Touch Factory Warranty is available on New and Refurbished Chairs. 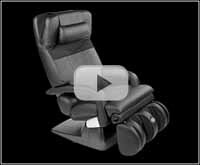 *WARRANTY INFORMATION: New HT-7450 Elite massage chairs have a 5/3/1 Year Factory Limited Warranty. The HT-1650 massage chairs come with a manufacturer's five-year limited warranty against Structural defects (Frame only - cosmetics are not covered). Parts are covered for three years from the original date of purchase. In Home Factory Service (All 50 US states and most major cities in Canada) is covered for one year from the date of purchase and can be extended with an extended warranty. 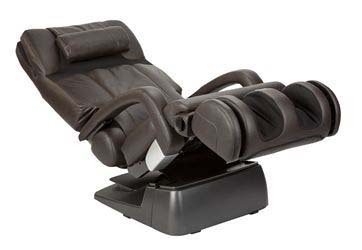 Refurbished Massage Chairs have a 90 Day limited residential use warranty for parts only. Chairs are packed for shipping and require minor assembly. Warranty is not valid for chairs shipped out of the United States and Canada. In-Home Service is only available in the US 50 states and most major Canadian Cities. Extended warranties are available on both New and Refurbished HT-7450 Massage Chairs. More Warranty Information.